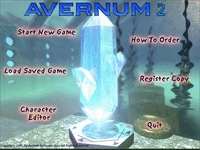 Avernum 2 is the sequel to the hit retro-rpg Avernum. Avernum 2, like its predecessor, is a classic fantasy role-playing game, designed for anyone who wants a huge game with a fascinating plot and who longs for the good old days of Ultima and Wizardry. It features beautiful 3-D, 16-bit graphics, including drawings by well-known fantasy illustrator, Phil Foglio, a massive storyline with three different game-winning quests (complete one or two of them, or even all three), and addicting gameplay.